14° Scattered showers, sunny afternoon. Ugliest goal of the year? FULL TIMEIt's all over at Aurora Stadium with Hawthorn too good for the Eagles, recording a 44 point win. 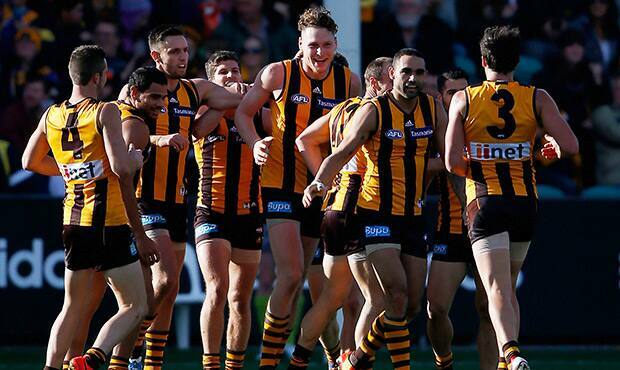 They were led by Jarryd Roughead who kicked 8 goals. GOAL HAWKSRoughead equals his career best effort running onto the ball and giving his opponent the slip, before running into the goal square for the icing on the cake. Hawthorn still have some handy tall timber to come back into the line up with David Hale and Josh Gibson amongst those missing. It has been a solid workman like performance by Hawthorn today with the Hawks working hard when they needed to, creating the lead they comfortably have at the moment. GOAL EAGLESMcGovern marks in between two defenders and goes back from 40 metres. 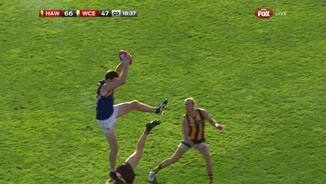 He has a deliberate kicking style and again never looks like missing. GOAL HAWKSLowden is pushed out in the marking contest with Glass professing his innocence. Lowden will have a debut he will never forget as he kicks his third goal! Await the Powerade shower! GOAL EAGLESMcGovern marks and lines it up from just inside 50. The kick is on its way and never looks like missing. The sting has well and truly gone out of the game with the result well beyond doubt. Hawks InterchangeBilly Hartung and is possibly out for the game. 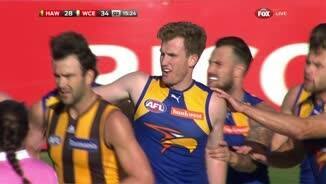 Roughead fires at goal looking for his eighth but he kicks it across the face of goal and out of bounds on the full. The Eagles are simply trying to limit the damage at the moment with Adam Simpson looking on from the coaches' box. BEHIND HAWKSSmith tries one from distance, but his shot bounces away to the right. BEHIND HAWKSBurgoyne is tackled as he kicks it but his shot misses to the right. 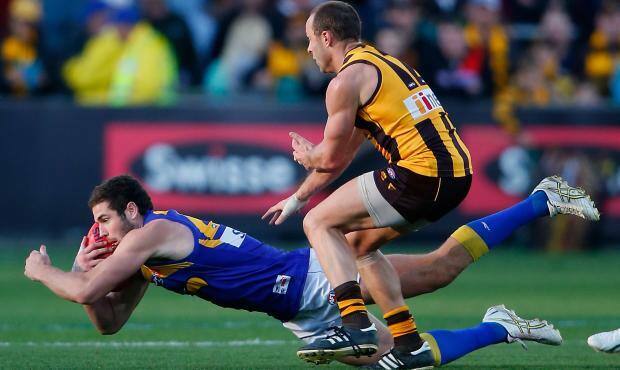 The Eagles are finally beginning to show some fight in the final quarter when the match is seemingly over. GOAL EAGLESWest Coast pull another one back with Gaff receiving it over the top in the goal square. He gets bumped for his troubles but still manages to kick his third. 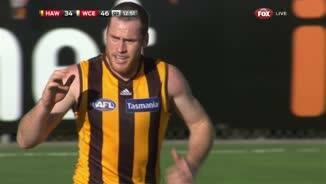 Hawks InterchangeJarryd Roughead off due to an injury. Welcome to Aurora Stadium for the Hawthorn v West Coast Eagles Round 12 clash. HAWTHORN has shrugged off a lengthy injury list to comfortably outclass West Coast by 44 points at Aurora Stadium. 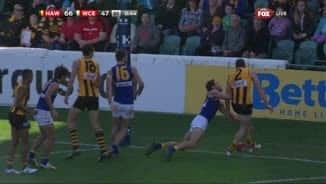 In the Launceston sunshine, Jarryd Roughead had a picnic, feasting on a slew of Eagles defenders and dominating each of them to the tune of eight goals, an equal career-best. West Coast was more than competitive in the early skirmishes and led by a goal at quarter time but their continued inability to create chances for their besieged forwards proved costly, and they simply didn't have a target of Roughead's stature. The premiers responded strongly, with Roughead kicking four second-quarter goals on the way to the big forward equalling his highest goal tally, set against Carlton in 2009. 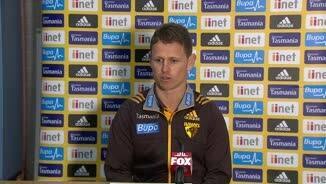 "(He is a) very proud person (who) wasn’t happy with how he performed last week," stand-in coach Brendon Bolton said of his spearhead after the game. "He’s kicked eight goals and also laid some really good tackles. Also showing plenty of spirit was 23-year-old Luke Lowden, who finally broke through for his first AFL start in his sixth season at the club. “Isn’t that exciting for a young bloke?” Bolton said. “He arrived in 2009 weighing somewhere between 75 and 80 kilograms, so he worked hard to build his frame. Our club has had to be patient and wait because bigger blokes take time, and against two quality ruckmen he held his own. Jack Gunston also played a smart supporting hand of three majors. As opposed to last week's nervy win over the Giants, the Hawks showed their best in patches, with trademark fast movement and sharp kicking. It was two spells that signalled death for the Eagles - five goals straight at both the end of the second and third terms. 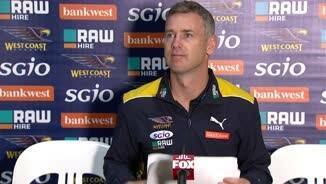 “When the game gets played in their half as it clearly was after that period of time, I’d say it’s a matter of time," Eagles coach Adam Simpson said in summing up the costly lapse by his team. "They know how, when they smell blood, they can destroy you. “I don’t want to compare leaders, but they clearly had an impact on the game. I can’t wait for two or three of our leaders to stand up and match them, it’s a collective responsibility." Simpson admitted there is plenty of work to be done on the training track if their season is to recover. “We’re just going to concentrate on the fundamentals,” he said. “It might sound really boring but we just need to get that right. The second half was much flatter, with the exception of 10 scintillating minutes. The Hawks again kicked into gear with five goals in the third term to put the game out of West Coast's reach. Fittingly it was Roughead who finished the rout with a late crumbing effort. Luke Hodge (28 disposals) was his brilliant self for the Hawks, leading wave after wave of attack while Jordan Lewis (30) and Isaac Smith (24) were also impressive. Cyril Rioli avoided the green vest to play three solid quarters for Hawthorn before being subbed off with a term to play but his replacement, Billy Hartung, suffered a hyper-extended elbow in the final quarter. The Eagles had plenty of accumulators, such as Andrew Gaff (26 disposals), Mark Hutchings (28) and Luke Shuey (29) but only Gaff, ex-Hawk Xavier Ellis and second-gamer Jeremy McGovern could garner multiple goals. The Hawks move past Geelong into second spot on the ladder and face Carlton at the MCG next Friday night. 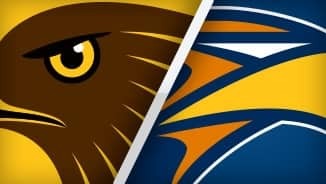 The Eagles' season appears shot and they will likely go into their clash with Gold Coast next week in Perth as underdogs. 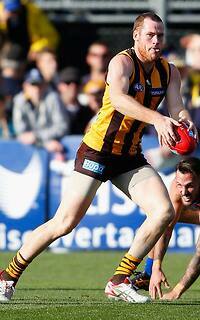 Hawthorn: Billy Hartung replaced Cyril Rioli in the fourth quarter. West Coast: Sharrod Wellingham replaced Xavier Ellis in the third quarter.